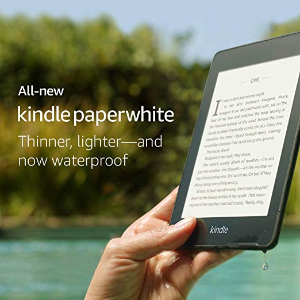 Amazon.com offers the All-new Kindle Paperwhite – Now Waterproof with 2x the Storage 8GB for $99.99, 32GB for $129.99. Features: The thinnest, lightest Kindle Paperwhite yet—with a flush-front design and 300 ppi glare-free display that reads like real paper even in bright sunlight. Now waterproof, so you’re free to read and relax at the beach, by the pool, or in the bath. Enjoy twice the storage with 8 GB. Or choose 32 GB to hold more magazines, comics, and audiobooks. Now with Audible. Pair with Bluetooth headphones or speakers to listen to your story. A single battery charge lasts weeks, not hours. The built-in adjustable light lets you read indoors and outdoors, day and night. Get instant access to new releases and bestsellers, plus over a million titles at $2.99 or less.